Give your dollhouse a realistic exterior using textured paint compounds, stencils, and a soft touch. Here you'll find tips, resources... and a dollhouse photo reference. You can give your dollhouse the kind of realism that makes people ooh and aah, and it's not necessarily about spending a lot of money. In other words, it's not all about the quality of your kit, or the architectural upgrades. A lot of it comes down to soft skills... and the things you apply with a palette knife and a soft touch. You will want to invest a bit in pastes and paints! If your house is made of punch out plywood, you'll need wood filler to fill in the gaps. You'll also need textured paints or compounds -- punch out plywood doesn't have a realistic texture (at least for a house in 1:12 scale). Another thing you'll want to do is look at photos of real houses. It can be inspiring to look at photos of dollhouses, but most have only a moderate level of realism. 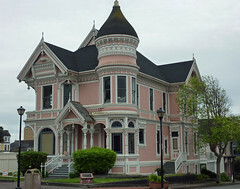 So how about looking at little pictures of real houses in the style you're trying to achieve? Pay attention to textures and to discolorations -- real houses seldom look like the finish came straight from a jar. Once you've found a a photo that has the look you want to achieve, once you've observed the textures and the imperfections, then what next? The same finishes that give furniture an aged look can work well on dollhouses. 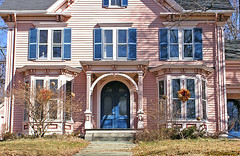 Instead of painting your clapboard house a solid color, how about drybrushing a lighter color over a darker one? You'll likely want to master some faux finishes. There's a lot you can do with basic paints and glazes. So many dollhouse styles look good in stucco - texture is a part of the illusion, and something you won't want to skimp on. You can easily buy stucco-like acrylics and apply them straight from the jar. Stucco isn't your only option however. If you buy stencils, you can (almost) as easily apply a brick or stone compound. There are compounds and stencils sold for just this purpose. You can add to the effect by deliberately creating small variations in color. Stencil cream works well for antiquing and creating subtle variance. It struck me, when I first moved to Seattle, that I had come to a dollhouse city. I guess it's the era in which the city grew up. 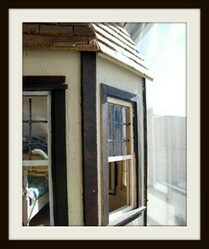 A person can find most of the popular dollhouse styles represented. 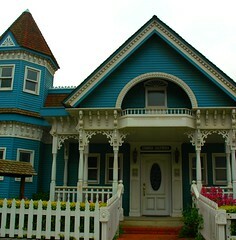 Victorian houses with Eastlake styling and Painted Lady colors? Oh yes, Seattle grew up during the industrial revolution, when factories were (ironically) churning out delicate and lacy trim. Tudor (or rather Tudor revival)? Ah yes, that too, in a variety of textures and colors. And then there are the Cotswold, or storybook, cottages with curvy, arched front doors. I thought those only existed in dollhouse or picture book form until I saw Seattle. The real ones come in brick, stucco, and stone -- something you may want to remember if you purchase one of those inexpensive gingerbread-style dollhouse cottages. They, too, can be made to look authentic. Look around you -- there are a lot of things that can create a miniature illusion. I think that cork, for example, has a texture that resembles shingles. 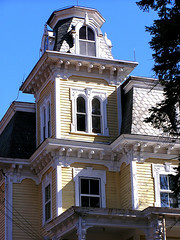 It's easy to cut, and it's actually not necessary to use shingle dye. I just dilute a little brown paint. Another thing that can be recreated, pretty easily, is the look of leaded glass. I make leaded glass dollhouse windows and doors with a fine graphic tape. Americana Stuccos are unique, heavy-bodied textural paints that can be used in a variety of free form ways to add texture to furniture pieces and home décor accessories. What little girl wouldn't want to make some accessories for her dolls.